Although she was seen regularly on the Clyde for a number of years, Tuesday saw the first visit for some time for BRO ANTON, and she was seen the following day after having been - unusually for one of her class - upriver at Clydebank. 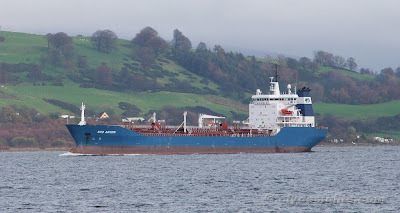 Having discharged a cargo of products from Rotterdam, BRO ANTON was sailing for Brodick Bay where she would wait for orders for her next cargo. Spanish-built in 1999 as UNITED ANTON the 16,376 tonne ship, which has an overall length of 144.1 metres, was renamed in 2000 when the United Tankers fleet was absorbed into the Brostrom fleet.